Last week I talked about my experience with capsule wardrobes, and how they helped me discover my style so that I can have a closet full of clothes I truly love. I also surprised myself by learning that having a smaller number of pieces I love actually gives me more versatility than a closet full of random bargain buys or items that aren’t quite right. 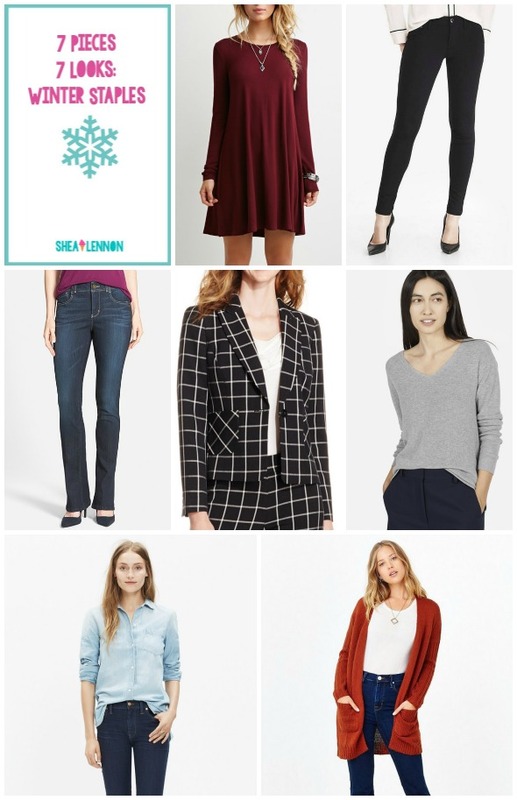 I mentioned a few of my winter staples last week, and I thought I would take a few of those (plus a few year-round staples) and show how easily remixed they are. In the fall I wrote a post where I created 7 different looks from 7 fall staples. Today I have a winter version, also with 7 looks from 7 pieces. By adding some accessories, like my plaid scarf and ankle boots, I can easily create 7 different looks using these 7 staples. What winter items have you been wearing on repeat lately? Linking with Mix it Mondays, Hello Monday, Let it Shine, A Lovely Little a la Mode, Confident Twosday, On Trend Tuesdays, Bloggers Who Have Inspired Me, Oh Hey Girl, and Thursday Fashion Files. Great remixing and especially loving that blanket scarf!